The Beachside Balcony is a beautifully renovated huge apartment with spectacular balcony views, right on the beachfront. 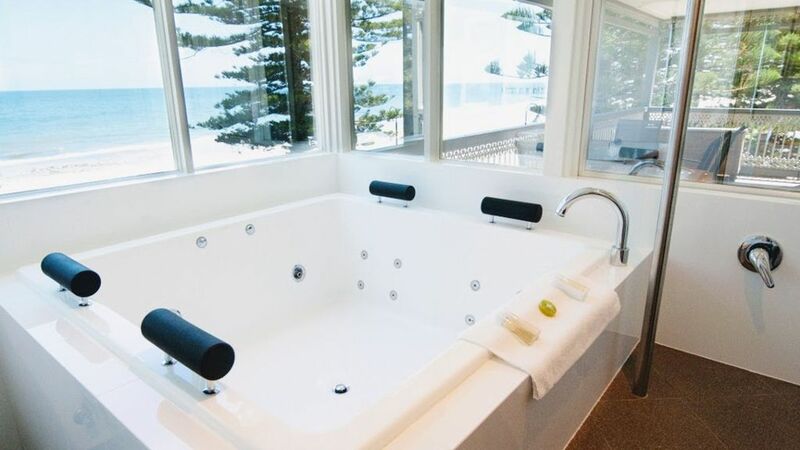 Whether dining on the private balcony or relaxing in the 4 person spa bath, you can enjoy views all the way down the coast! The apartment is situated in an historic terrace building with grand features and high ceiling. The large opulent lounge room is the heart of the space for entertaining, adjacent to the balcony catching the sea breeze. There is a separate dining area with a fully equipped kitchen. There are 3 comfortable bedrooms. In the master bedroom there's a queen sized bed, en suite and a spa for 4 with fantastic sea views! The Beachside Balcony is fabulous - a light and spacious 3 bedroom 1.5 bathroom seafront apartment which accommodates up to 8 people - perfect for a group of friends or 3 couples to share. Beautiful old building, looks very nice from the outside. Was a nice place to stay. Was very clean on the inside. Didn't like all the stairs, too many to lug all our bags up. The beds where not real comfortable, but were ok. It was great to find accomodation for our large family. Thank you for the review and feedback! If stairs are an issue, we do have some groundfloor options as well! 1 Olive Court was an amazing apartment and we are so lucky to be able to have stayed here! The view was divine, even with stormy weather the first night. Our 2 families fit comfortably and it was great to have a full working kitchen as well. The beds had beautiful linen, blankets and cushions and the whole place had a beachy, homely feel. And then the amazing spa bath - the best view I’ve ever seen from a nice warm spa! The service was outstanding, nothing was too much trouble the whole way along. We will definitely return and we would recommend anyone who would listen that this is the place to stay in adelaide!